Since 2010, Action Contre la Faim (Action Against Hunger) and a scientific committee led by a small group of researchers (Tufts University, Institut de Recherche pour le Développement, World Food Program) and technical experts have collaborated to develop a method to analyse the complex, dynamic, locally-specific causes of undernutrition. 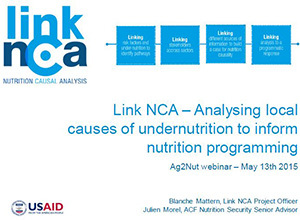 The Link-NCA method for Nutrition Causal Analysis is structured and participatory. Community-level qualitative enquiry illuminates context-specific and community-defined causes of undernutrition, while directly integrating local communities early in the process. To date, 14 Link-NCA studies have been implemented in a range of contexts, revealing diverse causes of undernutrition and a variety of causal frameworks for understanding such causes. The Link NCA overview, detailed guidelines, technical tools, and study reports are now available on the website. This webinar presented the rationale and the need to conduct nutrition causal analysis to enhance nutrition programming, introduced the main features and steps of the method, and provided examples of findings of Link-NCA studies undertook recently.